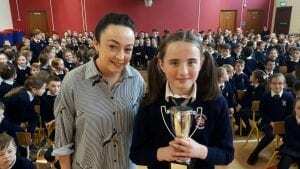 We held our February assembly last Friday in Halla Setanta. Fr. Rushe opened up with a prayer and spoke to us about the importance of Lent which has just begun. Master then called out all the achievements of our Junior School and the Student and Person of the month awards were announced and presented to the worthy winners by their teachers. After the awards, Mrs. Farren called up the members of the Green School Committee, who are working tirelessly around the school as we seek our 7th green flag, to present them with their special Green School badges. Master also spoke about how successful our clothing collection last month was as we collected 1,050kg worth of clothes! 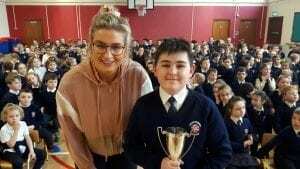 After this, Master spoke about Seachtain na Gaeilgea agus na gníomhaíochtaí go léir a bheimid á dhéanamh sa scoil. He also gave an example of a Ceist an Lae. Ní bhfuair morán daoine an freagra ceart dar ndóigh! We then heard the Senior School achievements for the month followed by the Senior award winners. 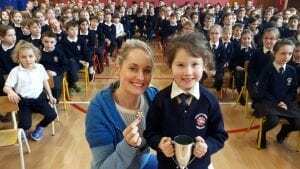 Master then told the assembly about a former student who we need to get behind when the live shows of Ireland’s Got Talent begin. Caitlin Rooney – who’s brother Mark is in Rang 6 – is part of “Fly Youth” who auditioned successfully for IGT on last Saturday evening’s show! 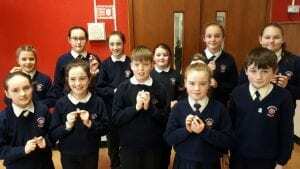 Rang 2 were then wished the very best of luck for their upcoming First Penance which will take place on Wednesday evening. Their teachers, Mr. Clune and Mrs. McKeown, have been working very hard with the classes to prepare for this very special occasion. We then were given a huge surprise, as four members of Rang 6 revealed what had been hidden behind two old sheets at the top of the Halla. 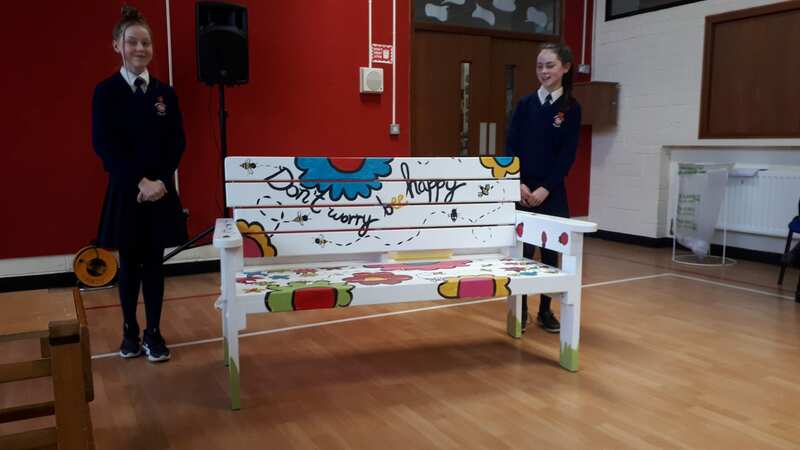 Rang 6 have been busy decorating two buddy benches which will be placed in the school yard in the coming weeks to encourage friendships at break-time. 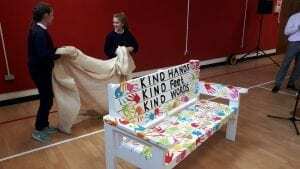 After the excitement of the reveal, Master announced the tidiest and most eco-friendly classes of the month and congratulated the Youth Choir, led by Ms Sweeney, who sang beautifully at Saturday evening mass last week which was recorded for LMFM radio. 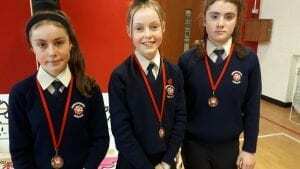 Before we finished up our busy February Assembly, the girls Cross Country team received their medals from the Drogheda and District Schools Cross Country event which was held last month. None of the girls had ran Cross Country before this event, yet they finished third overall on a day where over 100 girls took part!